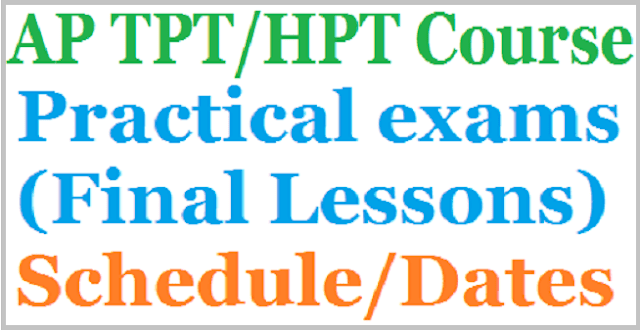 AP TPT/HPT Practical exams Schedule/Dates 2017, AP TPT/HPT Final Lessons dates, AP LPT practical exams dates, AP LPT HPT practical exams dates, Final Lessons for Language Pandit Trainees, Pandit Training Course Final Lessons Schedule, AP TPT HPT Course Final Lessons. The Practical Examinations in Final Lesson for the TPT/HPT Trainees for 50 marks have to be conducted by the External Examiners before completion of the Course. These examinations have to be conducted in identified High Schools for 10 continuous working days from 11-04-2017 to 22-04-2017 (both days inclusive). Sub: TPT /HPT Course for the year 2016-17 - Conduct of Practical Examinations in Final Lesson for Pandit Trainees - Nomination of External Examiners -Schedule issued - Regarding. Ref: G.O.Ms.No.80 of School Education (Trg-2) Department, dated.02-05-2005. ORDER: All the District Educational Officers in the State are informed that as per the G.O. cited, the Practical Examinations in Final Lesson for the TPT/HPT Trainees for 50 marks have to be conducted by the External Examiners before completion of the Course. These examinations have to be conducted in identified High Schools for 10 continuous working days from 11-04-2017 to 22-04-2017 (both days inclusive). Therefore, all the District Educational Officers are requested to nominate School Assistant (Language) or Grade-I Pandits from within a radius of 8 kms from the school constituted for conducting Practical Examinations in Final Lesson for the Pandit Trainees of Convener Quota & Management Quota candidates only. In case of non availability of Grade I Pandits, Grade II Pandits with not less than 10 years of service may be nominated from Govt. & Z.P. Schools. No remuneration and T.A & D.A is allowed for practical examiners. All the Principals of Pandit Training Colleges are requested to approach the District Educational Officers concerned with number of Trainees who have admitted through Convener Quota and Management Quota only and chalk out Batch wise Time Table for nominating the External Examiners for the conduct of the practical examinations . The marks awarded to the Trainees in the Final Lesson should be posted and sent to the name address of Sri .. K.Suryanarayana, DCGE., Olo Director of Govt Examinations, Andhra Pradesh, Chapel Road, Hyderabad - 500001 immediately after completion of the Practicals in a sealed cover to be reached on or before 27-04-2017. The District wise list of Pandit Training Colleges is appended in the annexure. The receipt of these proceedings should be acknowledged forthwith.